In the middle of summertime, plants are producing. Berry plants produce berries, and flowering plants produce blossoms. The God-given purpose for the plants in producing the colorful display of fruit and flowers in the summer is to perpetuate itself — to produce young plants. The benefit to us humans is that the plants produce far more than they need for simple reproduction, and a lot of what they produce is beneficial to us. Most people, though, have no idea what is growing right around them, or how to use it. 1. 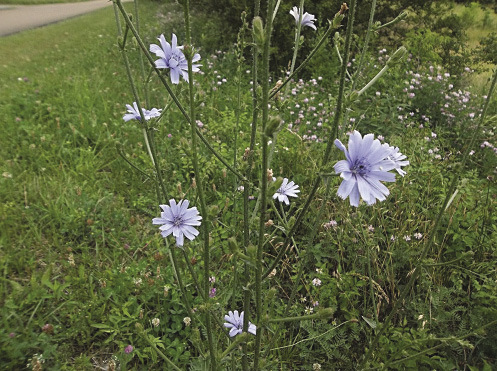 Chicory (Cichorium intybus) — The sky-blue flowers of chicory adorn many roadsides and open fields throughout the United States. Originally from the Mediterranean countries, chicory has long since spread throughout the world, primarily because its roots, roasted and ground, make a good coffee substitute. The young leaves also are edible, and often are gathered and sold as endive or escarole. 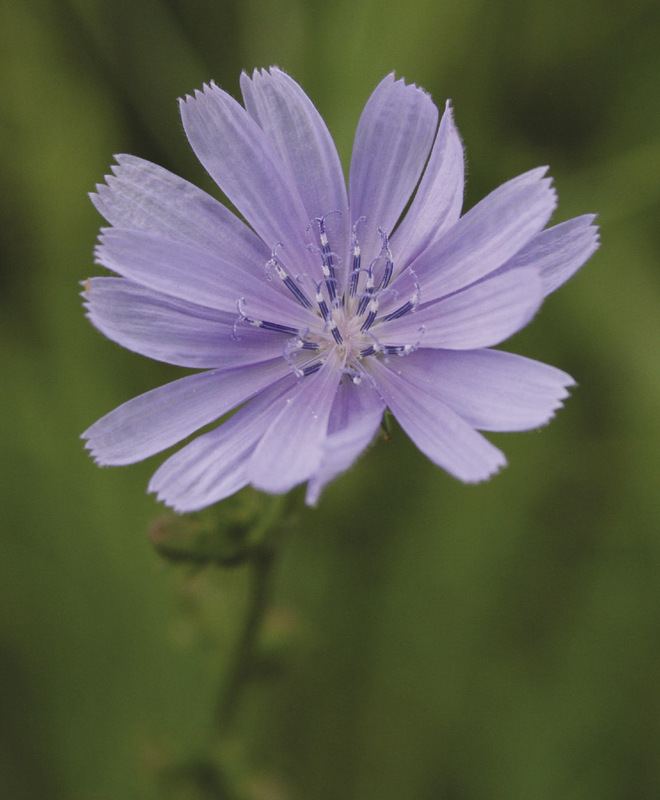 Chicory is a beautiful blue flower that’s edible. The young leaves can be eaten, and the roots are roasted and ground into a coffee substitute. 2. 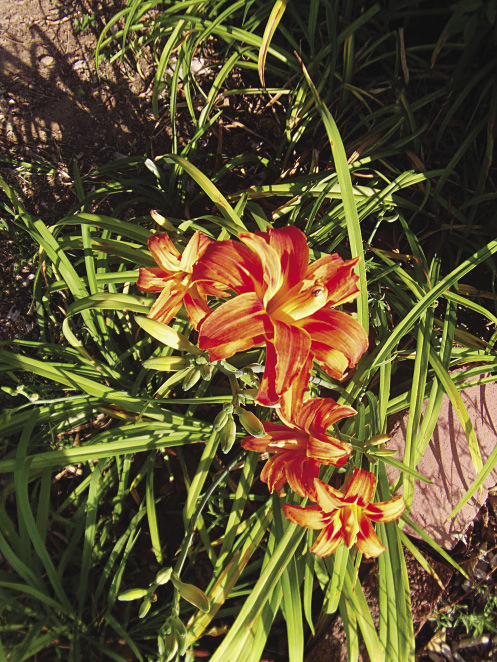 Daylily (Hemerocallis) — One of the first flowers you notice on the roadsides in July is the daylily. The brilliant orange and yellow blooms grow in prolific bunches, on slender 3-foot-tall stems. The flowers only last one day before wilting and falling off — hence the name. The brightly-colored flowers are edible, and are best batter-dipped and fried in oil. Daylilies can be eaten, batter-dipped and fried. 3. 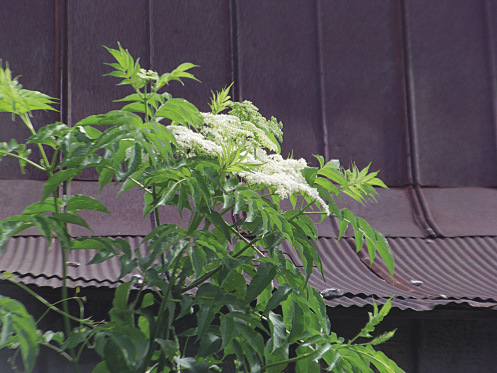 Elderberry (Sambucus canadensis) — In Tennessee, the elderberries begin to bloom in June. Within a month the blooms have fallen off to be replaced with berries. Elderberry is a traditional cure for influenza. Syrup made from the berries has been shown in tests to stop replication of the flu virus. You’ll have to be quick to gather the berries before the birds and deer eat them or the fragile fruit simply falls off the branches. Elderberry is a large shrub that can grow to about 10 feet tall, but some varieties get much larger. The bush looks lacy from a distance, as its slender, pointed leaves flutter in the slightest breeze. 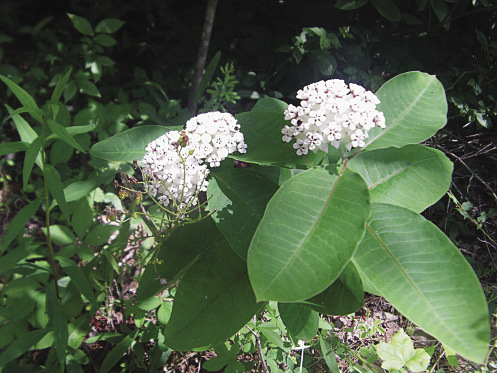 Growing wild in most of the eastern U.S., elder is easiest to spot when in bloom. Once you know what to look for, you will see them everywhere, as the white umbels of tiny blossoms grow all along fence rows and in abandoned fields. Elderberries are a traditional treatment for flu symptoms, and are best spotted by their white blossoms before the berries appear. 4. 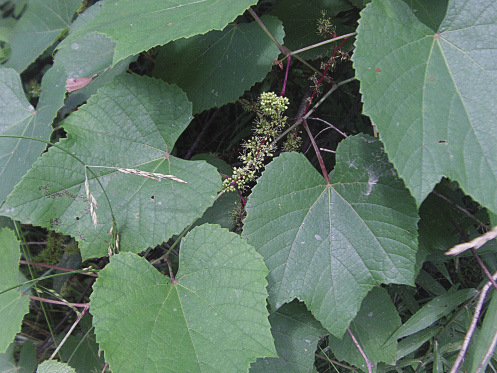 Fox grape (Vitus) — There are several varieties of wild grapes native to North America, and what we call Fox grape is just one. In July in Tennessee, the clusters of tiny off-white blossoms are transforming into tart native grapes. Vines can grow far into the tops of trees and are found in wooded areas throughout the continental United States. Fox grapes are one of several varieties of grape that are native to North America. In July, these tiny berries will begin maturing into edible grapes. 5. Huckleberry, or wild blueberry (Vaccinium) — There is a high bush variety and a low bush variety of wild blueberry growing in the eastern United States. The low bush grows here in eastern Tennessee and northern Alabama, and we always called it huckleberry. But whatever you call it, the small dark-blue berries are delicious! 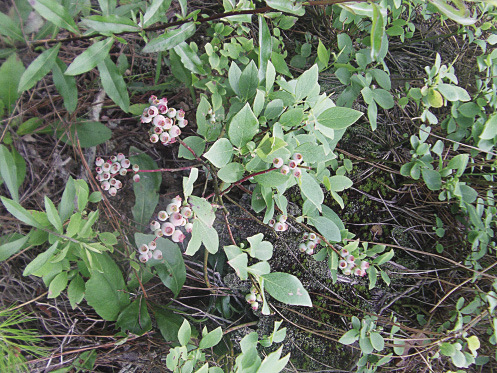 Huckleberry is a wild blueberry that grows in low bushes in the forest. These are just beginning to mature, and will be a dark blue-black when ripe. 6. Joe-Pye weed (Eupatorium) – Joe-Pye Weed is named for a Native American healer who was reputed to have used this medicinal plant to stop a typhus epidemic. The flowers grow in a cluster of fuzzy purple or pink, atop a two- to three-foot stem along roadsides and in clearings in the woods. It is a variety of Boneset, and all parts of the plant are edible. 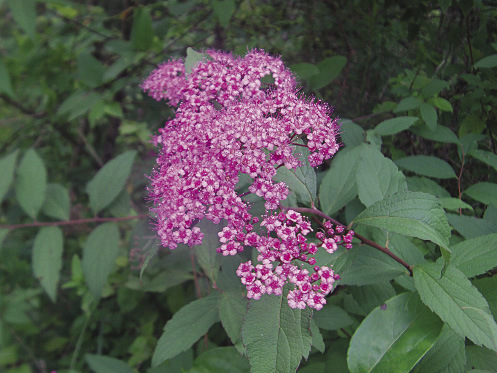 Joe-Pye weed is a colorful medicinal plant. 7. Milkweed (Asclepias) – Monarch butterflies have to have milkweed to survive. Monarch caterpillars eat nothing but milkweed. That should be reason enough to grow some, or at least not to cut it or poison it when found by the roadside or in an abandoned field. Milkweed grows on a straight stem several feet tall and is best spotted by its sleek, oval leaves that are as big as your hand when mature. At the top of the stem will be the flower, which is really a cluster of tiny blossoms in pink, white, yellow, or orange. The stem will “bleed” a milky sap when pierced, and the seeds pop out of a pod in a cloud of white fluff that the breeze spreads for many yards in every direction. While the narrow-leaved varieties are toxic, broad-leaved milkweed is edible. Many people cut the stem into pieces and fry it like okra. And dry stems can be stripped of their pith and rolled between the hands to form string that can be braided into stout cord. Milkweed is essential to the survival of the Monarch butterfly, but it also has many uses for humans. These are just a few of the useful plants found in the woods of summer. And, of course, this is the time of year to look for wild blackberries and raspberries wherever you live. God has provided many good foods in the woods and fields around us, and they are there just for the picking!